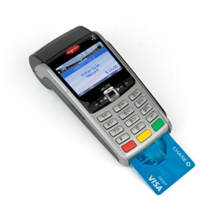 A credit card machine is one that will read the EMV chip or magnetic strip on a credit card. Using a credit card payment processing service like Merchant Cooperative will complete the payment process securely. For information on how the data travels over the internet visit our page on processing payments. For now, provide an overview on types of credit card machine hardware and how these systems work in real world businesses. 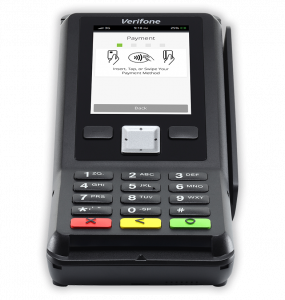 A credit card machine has several different names today: payment terminal, point of sale terminal, EFTPOS/PDQ terminal, or credit card terminal. When a customer is ready to pay for a product or service, they will insert/swipe their credit or debit card into the terminal. Data from the cardholder’s bank is then sent to the payment processing service (i.e. Merchant Cooperative). The payment processor will authenticate the transaction before sending funds to the seller/vender acquiring bank account. 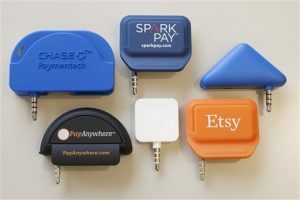 Modern credit card machines may be physically fixed in a single location like a countertop, or they can be mobile and accessible from anywhere. A counter-top credit card machine reader can either be connected to the internet with a wired or wireless connection. A reader using a direct high speed wired connection may also be referred to as an IP Terminal. A wired IP terminal used to be cheaper than running a wireless connection but recently costs have gone down for wireless terminals. An IP terminal will be more stable and faster than a wireless reader unless your internet connection is strong and secure. Modern credit card readers may also be virtual machines. These virtual machines are often referred to as point of sale or mobile readers. These can be run on mobile devices such as iPads, Androids, iPhones, tablet or a full desktop computer. A simple software download along with this device will have you selling items from anywhere. The setup is usually simple but sometimes the fees for selling on a mobile reader are higher than a stand-alone credit card machine reader. When you choose Merchant Cooperative, you are trusting us to find the very best technology for your company. We want to see your business succeed and our professionals are standing by to make this happen.